Last week I had the opportunity to sample some delicious gluten-free baked goodies made by Tully’s Bakery. Tully is an up and coming young female chef in New York City, originally from Memphis, TN, so she’s a gluten-free southern girl at heart. 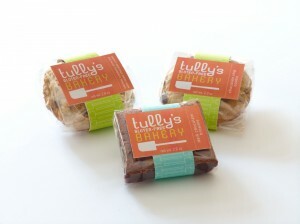 Diagnosed with celiac disease in 2008 and a graduate of Le Cordon Bleu in Austin, TX Tully’s made it her goal to create yummy gluten-free cookies and brownies that actually taste like cookies and brownies. I love seeing young women out there, making their celiac diagnosis into a positive life change. Tully has combined her culinary gift with a desire to serve and bring quality food to others with celiac and gluten allergies and intolerances. Not only are Tully’s cookies and brownies delicious, but I love Tully’s logo, website and the wrapping that she uses for her products. I got to taste Tully’s dark chocolate brownies and both varieties of her cookies, chocolate chip and oatmeal, cranberry, white and semi-sweet chocolate. All of her products shipped well and tasted fresh upon arrival. David and I enjoyed and savored all three varieties, but could not come to a consensus on our favorite. He said that Tully’s brownies were the best gluten-free brownies he’d ever tried and I agree. I’m definitely biased about my favorite Tully’s product though, and prefer the oatmeal, cranberry, chocolate chip cookie. I love a ‘trail mix’ combination of ingredients in a sweet treat. I’m always trying to put gluten-free oats into my food so I applaud Tully for doing just that. Part of what makes Tully’s cookies so good is that she bakes with milk and egg products and she doesn’t shy away from quality baking ingredients, as long as their gluten-free. She doesn’t try to fit every dietary need into one cookie and I’m confident Tully’s way makes for a much better cookie. 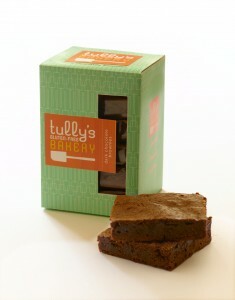 So now that you’re salivating just thinking about these baked goodies, you may be wondering, “Where do I get Tully’s treats?” Well, sadly for us Georgians, the only locations Tully sells her products are coffee shops and bakeries in New York, but you can order them online at her website. Tully’s prices are very reasonable for a made from scratch baked good. I’m hoping to get Tully’s into some Atlanta stores in the future, so I’ll keep you posted. I just tried her chocolate chip cookies and brownies today and they were awesome! Definitely a good find! I just tried Tully’s brownie last weekend and savored every bite! As a devoted chocolate-lover and a person NOT bound to gluten-free food only, I thought the brownie was superbly delicious. Perfect consistency, perfect rich chocolate flavor. While I too applaud new gluten-free chefs and bakers, I also wanted to share that multiple people have had gluten reactions after eating at Tully’s (now called Tu-Lu’s). I have Celiac disease and had a severe gluten reaction last week after eating one of Tu-Lu’s paninis. I was shocked to find out that the bread they use for panini has been known to be contaminated with gluten for years, so contaminated that the bakery where it is made (Sami’s) don’t even call it gluten-free anymore. Over the last few months, Tu-Lu’s has had multiple posts on Yelp from people who got sick from their panini, yet they continued to carry it. They seem to not understand that it is not a matter of being “sensitive”; people with Celiac disease cannot eat ANY gluten. While Tully does make everything else in her bakery, it cannot be considered a gluten free facility if the same people are handling the bread and the other baked goods. I think it is completely irresponsibly for a bakery that advertises its gluten-free facility to carry gluten containing bread. While I am glad that they have finally stopped making panini with this bread, carrying the bread for so long and causing illness in so many people with Celiac disease is inexcusable. Just had Tulu’s baked goods today for the first time. They are delicious. I drive 3 hours to go to the city and Tulu’s is definitley on my list of place to stop when in the city from now on. Have had Celiac for 12 years now and these are the best I have tasted in years. I loved her chocolate chip cookies! First gluten free cookies I have tried at a bakery that didn’t make me miss the real thing! A gluten free foodie who loves to cook and eat delicious food, Maya Bryant is also a consultant for people with celiac disease or people cooking for someone with gluten allergies. © 2019. glutenfreedomatlanta.com. All rights reserved.